Bora Bora is the stuff of tropical legend. Think of a brightly colored tropical fruit breakfast paddled out to a bungalow atop a brilliant turquoise lagoon. 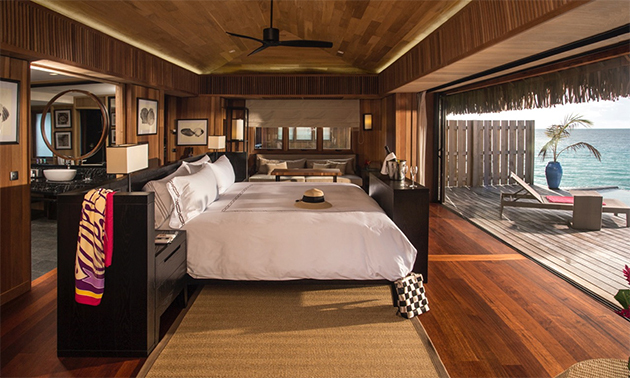 That’s Bora Bora, and the former Hilton property on Motu To‘opua is currently in the midst of a renovation and reflag which will culminate with its reopening in April 2017 as the Conrad Bora Bora Nui. The hotel was kind enough to share some photos and renderings of the public areas and guest rooms as a sneak peak of the upcoming reopening. Not only does the resort have the motu or islet, to itself, the resort also encompasses the smaller Motu Tapu within its confines for exclusive use of resort guests for relaxing or as a wedding venue. There will be complimentary water transportation available between the two islets. In addition to overwater and garden bungalows that offer a sense of seclusion and privacy (there are around a hundred units total at the hideaway resort, tucked away on the motu’s south shore), there are no fewer than six bars and restaurants to enjoy: Iriatai, the resort’s signature French restaurant, a sand-between-your-toes beach grill, an a la carte Chinese restaurant specializing in Cantonese cuisine, a lounge, a wine bar, and a swim-up pool bar. 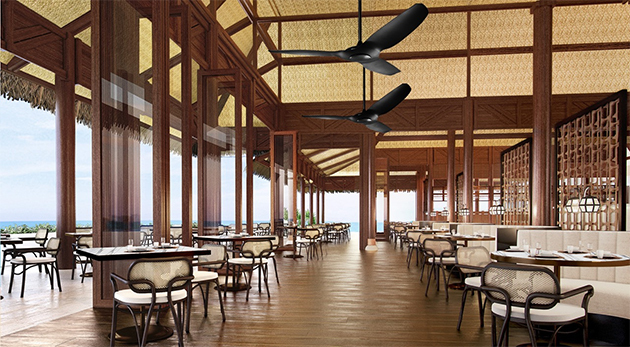 All will take advantage of the fantastic climate, with rich dark wood floors, high thatched ceilings and overhead fans for ventilation should the trade winds dissipate. Guests will be pampered by personal concierges, nightly turndown service, and 24 hour room service, which can be expected attributes of the Conrad brand. 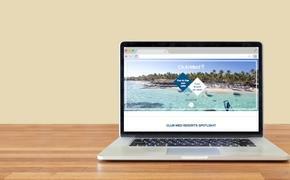 In addition, as is becoming increasingly common in the luxury sphere, guests can interact with hotel staff and request services via Conrad’s concierge app on their tablet or smartphone. There’s also a spa offering Elemis treatments and indoor/outdoor treatment rooms, some of which are large enough to accommodate couples massages. French Polynesia is a great getaway for those whose vacation style leans toward the languid, but for more active visitors the hotel staff can arrange transportation to and from the main town of Vaitape, where local goods such as locally made coconut soaps, vanilla beans and related products and other island handicrafts can be procured. The island is also the site of a former U.S. military installation dating to World War II. In the ocean itself, it’s possible to view or swim with dolphins, sharks, and rays (it’s best to closely follow local warnings and instructions concerning contact with nature) or explore the lagoon on a sailboat or jet ski. 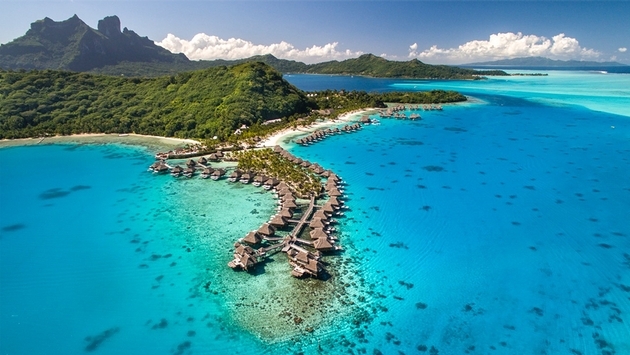 The resort’s redevelopment helps cement Bora Bora as a premier destination for luxury travelers – the revitalized Conrad property will join Four Seasons, Intercontinental, Le Meridien, and St. Regis resorts elsewhere on the atoll. Getting There: Faaa Airport in Papeete, on Tahiti, the nearest intercontinental airport is eight hours by air from Los Angeles and five hours from New Zealand or Hawai‘i. Local operator Air Tahiti (not to be confused with Air Tahiti Nui, the international airline of Tahiti) operates onward flights to Bora Bora, about 50 minutes from Papeete. The Damage: I found introductory rates from around $600 USD. Rates are charged in XPF (French Pacific Franc). Some rates include breakfast or half-board (breakfast and dinner). Good To Know: Timid sailors, beware: the resort is only accessible by boat. Non-seafood eaters should plan on a bigger food budget unless they want to go vegetarian; virtually everything not caught off a pier or day boat is flown in, and it’s expensive. Language: English, French and Tahitian. English-only speakers will rarely encounter a language barrier.